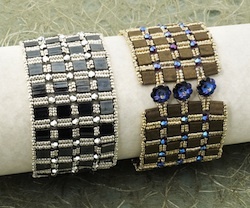 Hot dots cuff By Sherry Serafini - Get your bling on by stacking two kinds of sequins to make sparkling dots of color. 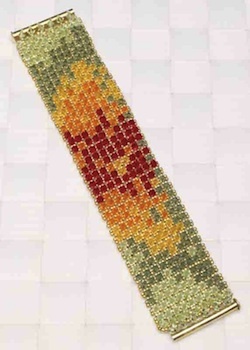 Peyote stitch a bezel and embellish a donut bead for a stunning focal on a suede-wrapped cuff. Then layer sequins to complete this fabulously fast bead-embroidered piece. The Quetzal's tail By Sue Sloan - This stitch, based on the Ecuadorian lace technique and crossed with daisy chain, creates bright plumage perfect for capturing a tagua nut ring. Crystal tapestry By Ludmila Raitzin - To capture the bright, cheery colors of summer flowers, start with a base of right-angle weave. Then, follow the pattern to embellish the base with bold crystal colors. 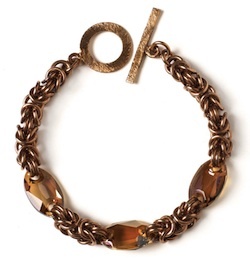 The weight of the crystals lends a luxurious, fabric-like drape to this bracelet. 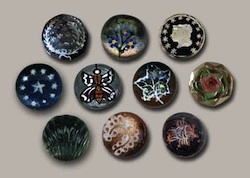 Backstory: Finding the fake factor By Becky Lyon - Two collectors shed light on the once-elusive process of authenticating Kaleidoscope buttons. 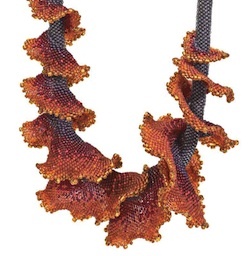 Ride the wave By Kris Empting-Obenland - Get caught up in the rhythm of increasing peyote stitch and color graduations to create this stunning neck piece. 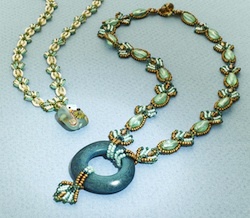 The spiraling, overlapping waves create a dynamic necklace that is full of life. 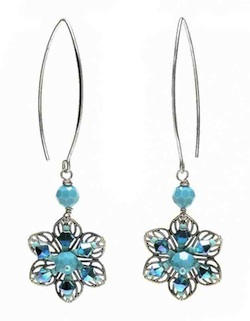 Easy-does-it earrings By Un-Roen Manarata - Embellish filigree components with pearls and crystals to create what is sure to become your go-to fashion accessory. Mesmerizing masonry By Lorraine Coetzee - Follow the maxim "use the right toll for the right job" promotes happy results in beading. 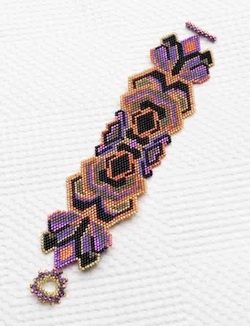 For this bracelet with shaped edges, the right tool – brick stitch – makes this complicated-looking pattern easy to achieve. 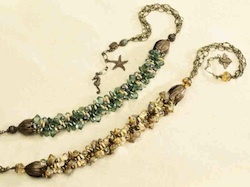 Sand and sea By Erin DeMotte - Glass beads in subdued tones flow together in this funky, chunky kumihimo braid. 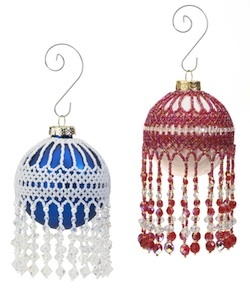 We've got Christmas covered By LindaMay Patterson - A netted band supplies ample space through which a neutral or colorful glass ornament can peek. 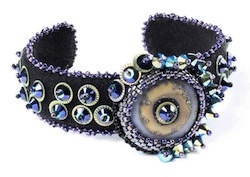 Suspend the bands from a beaded collar, and then embellish it with lots of sparkling fringe. 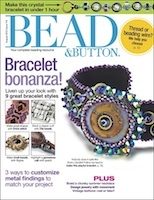 Bead Soup - The design challenge in the August issue uses two-hole beads. Instructions for one of the necklaces is available on our website. 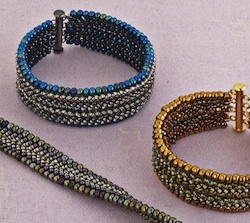 Read Bead&Button's Handy-Dandy Guide to Striped Seed Beads, Ask Anna answers a reader question about what material to use for stringing projects and what to use for stitching projects, and read beaders tips. Cubes and circles By Julia Gerlach - Combine round crystals and bead frames with crystal cubes for an everyday bracelet that can be made in under 1 hour. 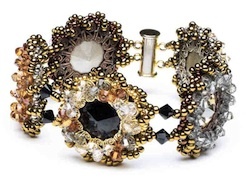 Meddle with metal in your beaded designs By Anna Elizabeth Draeger - Metal components provide structure and style while giving you plenty of opportunity for creative embellishing. Double duty By Ellen Tihane - This reversible spiral rope bracelet is a stitcher's delight, providing lots of options to play with color and patterns. Move for more movement By Margie Deeb - Giving jewelry a sense of motion doesn't require moving parts. In the fourth column of this series, we'll explore the movement inherent in lines, shapes, and repetition. 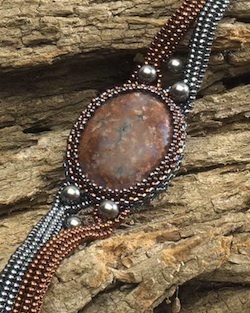 Wreathered rivolis By Cary Bruner - Sandwich a crystal stone between two filigree rings, and you have an innovative bezel plus a base for intertwining loops of seed beads and bicones. Link a series of rivolis for a bracelet that's a little metal, a little magic. 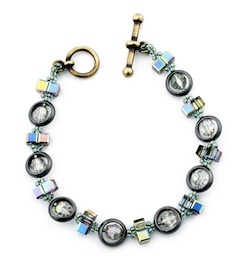 Crystal-linked cahin mail By Leslie Smith - Lighten up and brighten up a chain mail bracelet with Swarovski crystal links. Metallic hues blend seamlessly with the chain for the look if fine jewelry.